Signed copies (personalized on request) of the latest Sallis books are available from The Poisoned Pen bookstore in Scottsdale, Arizona. No Exit Press: Sallis' UK publishers. April news: Jim returned home from Paris and from Lyon's Quais du polar (100,000 attendees, panels on Jim's work, three-way discussions with Chris Offutt and Ron Rash, a free chat on jazz — complete with live band — between Jim and Michael Connelly) to learn that No Exit Press's "Ace double" edition of Difficult Lives/Hitching Rides has been shortlisted for the UK's HRF Keating Award. This book of critical essays will be out in the U.S. in October from Syndicate, at the same time Soho publishes Jim's new novel, Sarah Jane. From Soho the month before, the initial Lew Griffin novel, The Long-Legged Fly, will appear in a new uniform edition of all six, with the others to follow shortly. Also in October, Jim's fifth poetry collection, Ain't Long Fore Day, comes out from Unsolicited Press. As leaves fall from trees, books hit the floors scuttling for cover. December news: New reviews! Willnot has been reviewed by Lisa Tuttle for Ambling Along the Aquaduct, the blog for Aquaduct Press. Difficult Lives/Hitching Rides has been reviewed by Paul Burke for NB Magazine. 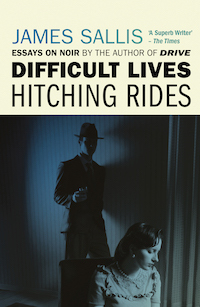 Difficult Lives/Hitching Rides is now out from No Exit Press in the UK. Jim's latest column, for the November/December issue of Fantasy & Science Fiction, is available. Also announced: Jim will be a guest at the festival Quais du polar in Lyons, France, in late March. Jim's recent story from Analog, "New Teeth," is up, wonderfully read, on the UK blog Starship Sofa. A much-expanded edition of Difficult Lives (backed with a collection of essays, Hitching Rides) is due shortly from No Exit Press in the UK; US publication by Syndicate Books is scheduled for spring of next year. Jim's new novel, Sarah Jane, is in production for fall 2019 publication by Soho Press in the US, No Exit in the UK. Next year will also see a fifth poetry collection, Ain't Long Fore Day, from Unsolicited Press. Adding to the above, New Rivers Press, which so beautifully published Jim's poetry collection Black Night's Gonna Catch Me Here a few years back, has accepted his latest story collection, Dayenu and Other Stories, and plans publication in 2020. I met Joe Lansdale for the first time in June, on a day buffed TV commentators were calling unseasonably warm… Joe and I'd both made tons of money writing science fiction, the way people do, and so we'd retired, but after having us around the house all day long week after week both our wives kicked us out, and we moved into the Charleton Arms. August news: Speaking of writers who influenced him, Scottish writer Doug Johnstone recently remarked on the Royal Literary Fund site that "Sallis' novels are among the best I've ever read." Listen to the entire two-minute audio clip. Johnstone also tweeted a bit of the same. The Magazine of Fantasy and Science Fiction — Books — November/December 2018. James Sallis reviews fantasy and SF fiction for F&SF. All original content is © James Sallis and may not be reproduced without the author's permission. Photography by Robin Johnston © 2015 used by permission.